If a good cup of coffee owes its distinctive flavor to its beans, a progressive organization owes its success to the people who are its body, mind and soul. And indeed, excellent human resources have been our biggest asset throughout our history and growth. Of the 300 and more people working with us, almost 60% are locals. It is our commitment to the local community and its economy and serves to remind us that our growth is not separate from theirs. With a name as unusual as this, you can be sure that Johnny is quite an unusual man. Unlike the others we have profiled here for you, your chances of running into Johnny during a short stay at our resort are slim. He is one of our many ‘behind- the- scenes’ workers; invisible, yet highly impactful! Your only meetings with him are likely to come about through that glass of chilled organic sugarcane juice you will have for breakfast, which he cultivates, presses and delivers to the restaurants each morning. Or through some of the delicious milk sweets and cakes you may have for dessert after lunch or dinner made with farm fresh organic whole milk that he supplies to our resident Patissiers. Johnny is almost like a member of our family. His parents came to work in the founding family’s plantations about sixty years ago from Kerala. He was born here with the rest of his siblings and while growing up, played childhood games and went fishing with some of the present directors of the resort. That’s how close he is to us! While in his teens he was bitten with wanderlust and left to try his hand at numerous vocations that included working in a factory, as a cleaner on a luxury bus that plied between Goa and Bombay and as a head load worker. His strong physique and supple hands disposed him naturally towards hard physical labor. Farming was written into his genes and when he returned to join us in 2002, he was given a 5 acre plot of land adjoining the resort to develop. Upon this he started an integrated farm run along natural farming principles, not using harmful pesticides or fertilizers. It is truly a text book model! Today, the farm is a profitable one and supports a dairy, a piggery and brings forth produce that includes bananas, sugarcane, an assortment of seasonal fruits, vegetables and rice for the resorts three restaurants. Johnny renders another very valuable service to the resort. He manages segregation and recycling of our dry waste. It is in large measure due to his proactive efforts and feedback from the field that we are constantly urged to seek new ways to improve waste management at our resorts. Just as in a drama where people behind the curtain play as significant a role as those in front of it, so also is it at our resorts. We have a small team of silent movers who, though invisible to most eyes, are the ones who go around making sure that you get all you deserve and more as a cherished guest – from great meals, clean linen, enjoyable activities and a lot in between and above. Kanthi is a silent mover of the highest order. She is one of our oldest staff, having joined us shortly after our resort in Coorg opened its doors to guests in 1994. If anyone can give you an account of the resort’s turns and transformations over this vast period it is Kanthi. She is in her element equally when furnishing you with the latest administrative statistics or regaling you with unusual and hilarious incidents from the resort’s early days. Her energy and enthusiasm seem to have no limits just as her eye for detail and trouble shooting abilities. She hails from a middle class Coorg family. 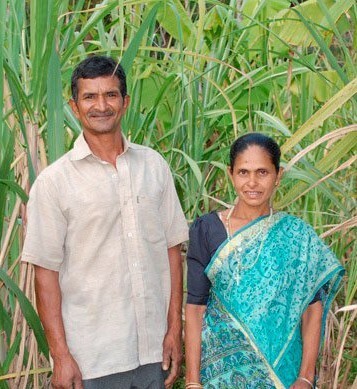 Her father worked in the plantation sector while her mother was a tailor. Kanthi proudly reveals that she continues being one to this day and is arguably one of Sidapur’s most reputed tailors of apparel for women and children. Could this good lady’s independence and zest for life have sparked a kindred fire in her daughter ? 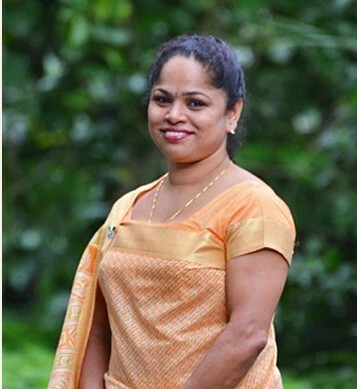 Kanthi graduated with a degree in Commerce in 1991 from the Besant Women’s College in Mangalore and followed this up with a Masters from the University of Karnataka (distance education) after she joined the resort. An ardent go-getter who is constantly raising the bar on her own accomplishments, Kanthi has just obtained an MBA in Hotel and Tourism Management from the Indian Institute of Management through a distance learning course of two years duration. Off-work, Kanthi shows other impressive sides to her oceanic personality. She is a devoted mother who tries to spend all the spare time she can get with her 12 year old son with whom she is not above playing a game of cricket whenever possible. She has adopted two girls from economically backward families and takes care of their educational needs, having comprehended from her own life the priceless value of independence that education can bestow. It is her way of making the circle complete, a debt payment to her society for the rights and privileges that made her what she is. It is a gesture that is as laudable as it is inspiring and gives us enormous pleasure to have someone of her mettle and vision with us.